FactCheck: are Australian and US climate targets the same? If you use the full Kyoto period — 1990 to 2020 — the US is minus 5% and Australia is almost exactly the same. Environment minister Greg Hunt, Radio National, November 17. We and the United States are pretty much on the same page. Over a 30 year period from 1990 to 2020, we have the same — roughly the same — reduction … If you compare apples with apples, the American position and our position on reductions are effectively the same. Treasurer Joe Hockey, Radio National, November 13. Treasurer Joe Hockey and energy minister Greg Hunt were responding to claims (see here and here) that the US-China climate deal put pressure on Australia to revisit its efforts to reduce emissions. The US target is a 17% reduction below 2005 levels by 2020 and, as pledged last week, a 26-28% reduction by 2025. Under the United Nations Framework Convention on Climate Change, Australia pledged an unconditional target of 5% reduction below 2000 levels by 2020, potentially moving to a target of 15% or 25% depending on international factors. The current Australian government mentions the 5% target only, implying that conditions for moving to the 15% and 25% levels have not been fulfilled (the Climate Change Authority disagrees on this). A key aspect of the recently announced US target is that it is for 2025. Australia has a long-term 2050 target of 80% below 2000 levels, and a range of short-term 2020 targets, but no mid-term 2025 target. It is therefore impossible to compare Australia’s target directly with the just announced 2025 target of the US. In order to make a comparison for the 2020 targets at least, we need to apply a number of adjustments. This will allow us to compare the US and Australian targets over the 30-year period up to 2020, as Joe Hockey put it, like with like, apples with apples. c) factor in population growth. An important part of this comparison is the impact of deforestation emissions. This factor was not taken into account in Table 3.1 of the International Climate Action Research Paper (page 21), which is presumably the basis for the ministers' statements. 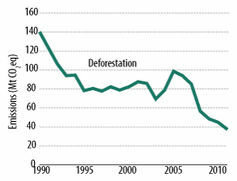 Australian deforestation emissions 1990 to 2011. Adapted from Climate Change Authority Targets and Progress Review, Figure D.39, showing historical data until 2011, i.e. without projections. In 1990 and 2000 Australia’s emissions from deforestation were significant, but are substantially lower today. Under the Kyoto Protocol, Australia negotiated a lenient second sentence in Article 3.7 (sometimes referred to as the “Australia clause”) that allowed Australia to include 1990 or 2000 deforestation emissions in the base year. Including deforestation increased the reference level against which the Australian target is compared to, as you can see in the figure below. The blue and grey dot for 1990 and 2000 at the top represent Australia’s emissions including deforestation, while the solid blue line represents Australia’s emissions without deforestation. Australian and US historical greenhouse gas emissions and 2020 targets. How the government compares them (left grey box) and an apples-with-apples comparison (right grey box). Australia’s Kyoto Protocol baseyears (KP baseyear) are shown as dots for 1990 and 2000. Own calculations based on UNFCCC National Inventory Submissions and Initial Reports by US and Australia. For all other developed countries, large deforestation activities stopped a long time ago and therefore do not increase base year emissions. Thus, while Australia compares future climate targets against past emissions that include those deforestation emissions, other countries — such as the US — do not. It is a good thing for the climate that Australia’s substantial deforestation activities have become a thing of the past. However, because emissions from deforestation have declined, Australia was able to substantially increase emissions in fossil fuels, industry, waste and agriculture, and still meet the 5% target. Deforesting some land in 1990 does not necessarily lead to more deforestation (and more emissions) in the future. In fact, it might lead to less because less forest is left over. Thus, high deforestation emissions in the past are little reason to provide lenient rules for future emissions. In contrast, high-emitting fossil fuel infrastructure with trucks, coal power plants and LNG facilities leads to higher emissions now and for some time into future — essentially until that fossil fuel infrastructure is retired again. Long story short: an apples-with-apples comparison would compare the US and Australia on the same footing. Thus, we account for US and Australia here basically as the accounting works for all other parties under the Kyoto Protocol i.e. excluding deforestation and forestry from the base year. Australian and US emissions developed similarly from 1990 to 1996. Thereafter, Australian emissions continued to increase, while US emissions levelled off and started to fall after 2007 (see image above). The US’s -17% target for 2020 now stipulates a further 1.1% reduction per year from 2012 to 2020 (relative to 2010 emission levels). The US just pledged to increase that reduction rate thereafter to 2.3-2.8% to 2025 in order to reach its 26-28% target. In contrast, Australian emissions can stay roughly constant — at 30% above 1990 levels — and still meet the 2020 target of 5% below the 2000 Kyoto Protocol Base Year. Thus, Australia’s 5% target represents vastly different levels of effort compared to that of the US with its nominal 17% reduction by 2020. US emissions must return to below 1990 levels (4% to be precise) while Australian emissions can stay at 30% above 1990 levels. To be fair, Australia’s population by 2020 is projected to be almost 50% higher than in 1990, while the US population will likely increase by only a third (UN 2012 medium population projections). There is therefore some good reason for Australia’s emissions to increase a greater rate. An apples-with-apples comparison would therefore look at per-capita emissions since 1990. It turns out that the US still outperforms Australia by a good margin over the 30-year period to 2020 (see figure below). While under its 5% target Australia will likely decrease its per-capita emissions to 2020 by 12% compared to 1990 levels, the US will do so by 28%, i.e., more than twice as much (under its 17% target). Every aspect of this condition has been met - or in fact over-fulfilled. We have just demonstrated that the US as an advanced economy has not only a comparable, but a more ambitious commitment than Australia’s 5% goal. 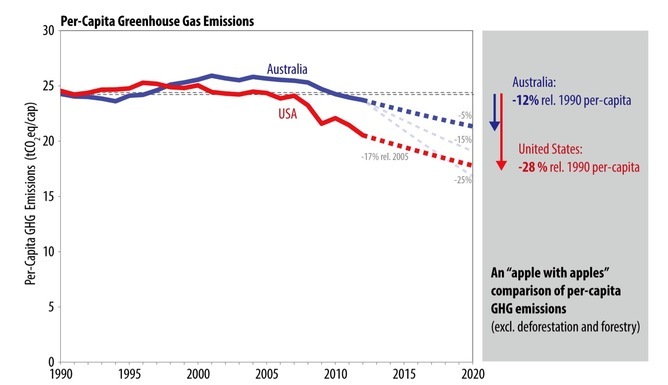 For Australia to match the US efforts over the 1990 to 2020 period in terms of absolute greenhouse gas emission reductions, a 29% reduction below Australia’s 2000 base year would be needed. Even if the legitimate argument were brought forward that population increases are expected to be greater in Australia than in the US, the 5% Australian target is no match to US’s 17% target. A 21% Australian target would be needed. As such, of Australia’s three proposed targets, only the 25% option would be sufficient to meet (and beat) US ambitions. Of its three proposed targets, Australia would therefore have to move to the most ambitious 25% by 2020 to approximate the US’s target. The conclusion is correct that Australia’s current 5% reduction target (for 2020 compared to 2000) is weaker than the United States’ 17% reduction target (for 2020 compared to 2005). The Fact Check also correctly notes that the conditions for Australia moving to a higher point in its target range, a 15% reduction or more, have been fulfilled. This has not only been pointed out by the Climate Change Authority, but it has long been argued by academics including Prof Ross Garnaut, myself and others. It is important to recognise that the US target announced at APEC is not the 17% target for 2020, but a 26-28% target at 2025 (compared to 2005). 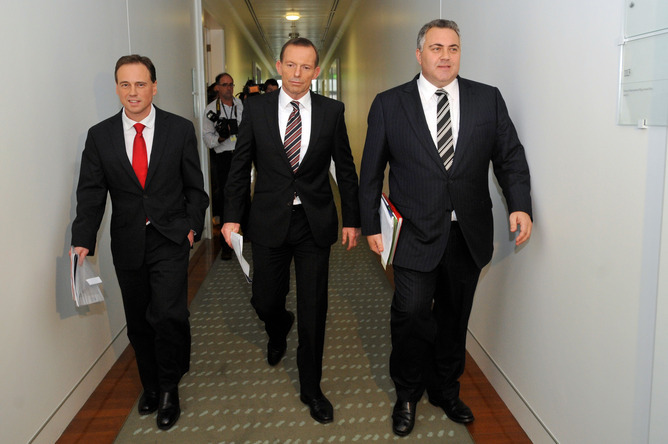 The Australian government has not made a post-2020 emissions reductions commitments. All countries are called on to submit their pledges early in 2015. The Australian Climate Change Authority has recommended a 40-60% reduction at 2030 compared to 2000. The Treasurer’s and Environment Minister’s assertion that the targets are “effectively” or “almost exactly the same” rely on comparing the 2020 target emissions levels for both countries to a 1990 base year, and including all emissions sources. This distorts the picture, as in 1990 deforestation was still a large source of emissions in Australia, as the Fact Check points out. The Fact Check points out that Australia’s population growth rate tends to be higher than that of the United States, so if countries were aiming for the same reduction in per capita emissions then Australia’s absolute emissions target would be somewhat less stringent than that of the United States. While this is correct in itself, it omits an important factor going the other way: Australia’s per capita emissions level is higher still than that of the United States. In a world that is gravitating towards equal per capita emissions allocations (with trading of allocations between countries to accommodate differences in physical and economic structure), the higher the per capita emissions level, the faster the required rate of reduction. Which of the two effects is stronger depends on the timeframe for convergence of per capita emissions. As a working assumption, we may assume they roughly cancel out, and go straight back to a comparison of reductions in absolute emissions levels. Have you ever seen a “fact” that doesn’t look quite right? The Conversation’s FactCheck asks academic experts to test claims and see how true they really are. We then ask a second academic to review an anonymous copy of the article. Anita Talberg is Academic Convenor of the University of Melbourne's Climate and Energy College. She is also the Science Coordinator for the Climate College's bilateral Australia-wide research project, the Australian-German Energy Transition Hub. Anita completed her PhD research on geoengineering at the University of Melbourne in 2018. Previously, Anita worked for the Research Branch of the Parliamentary Library in Canberra, providing analysis and advice on climate and energy to Federal parliamentarians. In 2011 she spent a brief period at the European Parliament in Brussels. A/Prof Malte Meinshausen is Director of the Australian-German College at The University of Melbourne since 2012 and is affiliated with the Potsdam Institute for Climate Impact Research, Germany. He holds a PhD in "Climate Science & Policy", a Diploma in "Environmental Sciences" from the Swiss Federal Institute of Technology, and an MSc in "Environmental Change and Management" from the University of Oxford, UK. Before joining the Potsdam Institute for Climate Impact Research (PIK) in 2006, he was a Post-Doc at the National Center for Atmospheric Research in Boulder, Colorado.